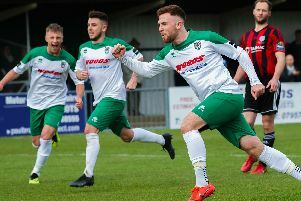 Chichester City captain Connor Cody was filled with pride after his side clinched the SCFL title and promotion to the next level of non-league football. The centre-half said: “It’s fantastic. It’s been a long time coming. The boys have worked really hard. The club’s been pushing for it the last few years and it feels great to finally get there. “I think a lot of it is down to the fact that as a group of players we have a very strong bond, both on and off the pitch, and that really helps. The coaches have got games spot-on. Chi have conceded only 28 league goals so far this season, and Cody feels their well-organised defence has contributed massively towards their success. Having previously played in the Isthmian League division one south with Worthing, Cody is looking forward to the tough opportunity the next level up will bring to Chi - who do not yet know if they will be placed into the Bostik or Southern League set-up.